There are many promotions that you are going to have with this card. All APRs are excellent. 9.99% for balance transfers and purchases. 13.49% for cash advance. You will not need to pay foreign transaction fees. There are good travelling promotions of the card. Citizens Community Bank World Elite Card is providing 1.99% APR for balance transfers in first 6 months. It is good opportunity for you if you need this feature in your card. $299 is too much for annual fee. It is unknown what are rewards rate of the company. Contact to bank for get more information. 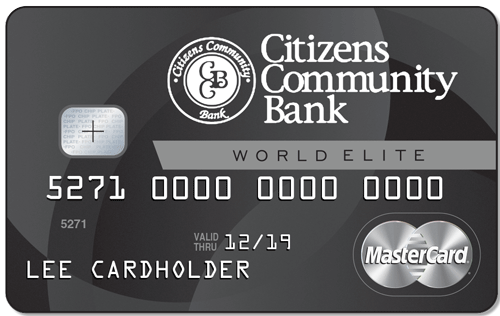 Citizens Community Bank World Elite Card is the card which has the lowest APR in the company. There are very low rates for purchases, balance transfers and cash advances in this card. You will only pay 1.99% APR for 6 months for balance transfers. After 6 months later APR is going to be 9.99% for balance transfers. The purchase APR is same with balance transfer it is 9.99%. However there is not introductory APR for purchases. Cash Advance rate is going to be 13.49%. You will not pay extras for foreign transactions with World Elite Card. You are going to earn better rewards with this card. However there is not any statement about rewards. Cash Advance fee of the company is a little bit high but it is not a problem since the card is providing 100% better APR most of credit cards. 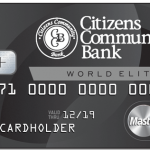 You can see rates, editor scores and user reviews of Citizens Community Bank World Elite Card below.